In our school, bullying is hurting someone more than once, on purpose, by behaviour or words which are intended to frighten or hurt that person. Emotional: Hurting people’s feelings, leaving you out. Physical: Punching, kicking, spitting, hitting or pushing. Verbal: Being teased, name calling. Cyber: Saying unkind things by text, e-mail and on the internet. 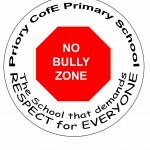 We have established effective anti-bullying policies and procedures across the school. Children know they can turn to any member of staff if they witness any bullying or feel that they are being bullied. A survey that was created by RRS and our PSHCE lead Mrs Bloor showed that the children trusted the adults that are in school. We have very few serious behaviour incidents that are deemed to be bullying. Staff and children work together and are dedicated to ensuring that all children are safe and well supported. We are all “Friends Against Bullying” (FAB) and regularly discuss bullying during worship and in class through our PHSCE programme. During National Anti-Bullying Week we hold our own FAB Week. All the children receive anti-bullying badges and take part in lessons, activities and assemblies all aimed at raising the children’s awareness of bullying, knowing what bullying might look like, knowing how those who are bullied might feel and most importantly what to do if a child or a friend suspects that they are being bullied. We have made posters, videos, raised awareness through poetry and worked together for a united approach against bullying. Several groups of children support playtimes. Children apply to join a group, and are interviewed and trained. We have displays in our corridors, so that these children can be easily identified. Priory P.A.L.S. (Play, Advice, Leadership, Safety): support any issues between friends, help children find someone to play with and help identified groups play together well. These children wear red hats on our playground at lunchtimes. This year we are introducing a brand new scheme of PHSCE throughout our school. The “Jigsaw Scheme” of work has anti-bullying units that will enhance our anti-bullying provision. The RRS Squad work collaboratively with Mrs Bloor to discuss ideas and implement the programme throughout the school.